I recently posted a conversion of Courtney Campbell's social attack rules to the AS&SH system. However, after crunching some numbers it became apparent that such a system (no matter how baroque and appealing to me) would produce rather unbalanced results, so I decided to redo the maths. My goal was to keep the rules simple while providing choice and strengthening class archetypes at the same time. I certainly like them better this way. Using an appropriate spell grants +SpellLevel to-hit bonus and deals double damage. Assassins deal double Fear damage. Bards consider each social attack type favoured, and deal +1 damage per odd level. Berserkers are immune to social attacks while raging. (cf. Unbreakable Willpower). Druids and Scouts deal double damage against animals. Monks have a point of social damage reduction per level. Rangers deal double damage against otherworldly creatures. Thieves consider each social attack type favoured. Witches deal double Charm damage. I have been slowly (and I mean very slowly) working on a wuxia-inspired setting and OSR compatible rules. Below I present to you five kung-fu styles, one for each of the five different colours of chi. Also, some notes on the rules. What I present below is the result of my recent toying with class mechanics. It is obviously unfinished (and contains a lot of Pathfinder-isms), but I believe it still communicates the concept I had in mind well. I have some ideas for the cleric class, as well, basing their abilities on domains and channeling power (a resource similar to the berserker's rage). The following is a summary and conversion of the social combat rules found in Courtney Campbell's On the Non-player Character. Characters may substitute one of their attacks (regardless of whether melee or missile) to make one of the following special attacks to deal non-lethal damage. Non-lethal damage is not deducted from one's current hit points but is totalled separately; once it exceeds 1/4 or 1/2 of the creature's current hit points, a Minor or Major effect takes place, respectively, depending on the attack type. N.B. : For the purposes of social combat, Intelligence modifier equals the number of extra languages, while Charisma modifier equals reaction bonus. In which the party inquires about a way of getting home, sets sail toward the west, and suffers a great tragedy. Although none of the works mentioned in Part 1 have been published in their final form, I am here to speak about a couple of other projects that have got my attention. Lately, I have become quite enamoured of AS&SH (see my review); I discussed it with the party and we decided to convert our campaign to AS&SH. Thus, this post both reports about the events of our last session and thoughts about the conversion and whether we appreciate the changes the new system brings to the campaign. For continuity's sake, further reports of this campaign will still be tagged Vikings & Valkyries, although I will, of course, add the ASSH tag, as well. In which our intrepid heroes gathered information about the mysterious sorcerer who attacked their village, travelled north to personally investigate a possibly related matter, and saved a damsel in distress. The following are complete games or supplements that are in the works (some of them on the verge of release, some still being playtested, and some still being written). This is in no way a complete list of what people in the OSR are doing; it merely includes the stuff I am personally aware of and interested in. However, if you think I left out something important, don't hesitate to put it in the comments. The following list summarises the mechanical changes the new half-edition of World of Darkness (that is, The God-Machine Chronicle) has introduced; as such, it assumes familiarity with the game's previous incarnation. Note that it does not list every single rule or change in the rules but rather helps see the main differences; as such, it does not substitute the rule book proper. I have been thinking about character abilities lately; more specifically, about how they are acquired. In OD&D and B/X (and most games derived from them) characters do not gain new abilities as they grow in levels (except for new spells); they only improve their already existing ones. In AD&D (and its derivations) character do gain new abilities, but they are tied to certain levels. In newer editions of the game players may often choose their characters abilities (be they feats or class abilities) off a list. I myself do not find character building much entertaining, but mostly because it is cumbersome and it is removed from the game world (i.e. my choices as an adventurer have no impact on which abilities I might be able to take). On the other hand, it feels rewarding to being able to pick a new ability and using it as soon as the right circumstances arise. The solution might be making almost every character ability diegetic regarding their acquirement. That is, classes could be designed with only a few key differences (permitted weapon and armour; advancement of to-hit bonuses; hit dice type; and one or two distinctive feature), and we could provide ways of gaining new abilities tied to the setting. To keep niche protection, abilities could also be tied to certain classes (that is, a character may not acquire every available ability). Also, if abilities are not equal in power, the difficulty of their acquirement can be adjusted properly. How many hits do I need to kill that thing? I was trying figure out the minute (or not so minute) differences between various hit point and damage systems. For that I just made a simple spreadsheet (available here) where I calculated a number of things - I thought it may be some help to others. I provided a minimal amount of notes (how I obtained the average HP and damage at a given level), but the following should be notes, as well. The first and sheet includes how many HP a character (or creature) may have at a given level and how much damage he may deal. Assuming an opponent of equal level or Hit Dice, you can find the number of hits it may take on average; after that, how many attacking attempts are required depending on your chance to hit (25%, 50%, and 75% of success, respectively). The third and fourth sheets differ: they show you how a character of a pre-defined level (1st, 3rd, 5th, and 7th) compares to creatures of various Hit Dice. Therefore, average HP is calculated for the creature and damage for the character, and the number of hits or attacks are calculated from the character's point of view. 2014. 03. 13. edit: Last night I updated the file for there were some incorrect functions. Shouldn't have done it so late, I guess. Labelled in my notes as Black Metal Marsh, I present you this short background of the setting. No doubt it was inspired by the pitch of Rafael Chandler's new game (although when I read it first somewhere else only the short version was available). The original idea was to use Robert Conley's Blackmarsh as its basis; now I'm not sure if I will follow through with it (nevertheless, I haven't found a suitable alternate name yet). It was believed that the world always existed and was never changing, for nothing could ever exist without Law and Order. Angels of the World Above served the incredible power that is the Operator and watched over mankind, inhabitants of the World Below, with ever vigilant eyes. None would have suspected that it be one among them who would betray the very foundation of the known universe. Ledsabbath, an angel of the highest rank, found the never changing notes of the divine choir boring and the mortal crowds' uniformity pathetic; he wanted something that was never conceived before, something new. This is a review of Astonishing Swordsmen & Sorcerers of Hyperborea (henceforth AS&SH), a game published by North Wind Adventures. AS&SH is a complete game, rules-wise mostly resembling 1st edition AD&D; its official world, Hyperborea, is greatly influenced by the works of R. E. Howard, H. P. Lovecraft, C. A. Smith, E. R. Burroughs, Fritz Leiber, Abraham Merritt, Michael Moorcock, and Jack Vance (the list is actually from the book), and it has a good deal of sword-and-sorcery and weird fantasy elements. The game comes in a box with two books (Player's Manual and Referee's Manual) containing three volumes each, a poster map of Hyperborea, six character sheets, and some dice. Unfortunately, I cannot talk about the quality of these as I only bought a pdf copy (honestly, with international shipping costs added, the boxed set was way too expensive for me). Nevertheless, the books are extremely well-written and superbly edited; the reader is oft guided to other sections of the same or of other volumes and is given notes reminding him to important and useful things. This year's first face-to-face gaming session, during which we tested the mass combat rules found in the M&M Companion (slightly changed to reflect minute differences between M&M and V&V), some general raiding rules (mostly inspired by Aegir's Fire), and my crudely programmed village-generator; lastly, the party returned to Jarl Olaf Gunnbjörn's court and became involved in the local politics. Hulks and Horrors, written by John S. Berry and released by his very own Bedroom Wall Press, is a neo-retro game, designed specifically to be a game of "dungeon crawling in space". Its mechanics are partly derived from B/X D&D and, as a result, compatible with most D&D-esque games to a great extent. It provides an exploration-based game structure focussing on crawling through abandoned hulks, space stations, and ruins found in uncharted sectors. When it comes to house rules that signal a particular flavour and reinforce atmosphere and genre conventions true of a setting, Clerics and the workings of divine magic are one of the most often reworked parts of D&D. 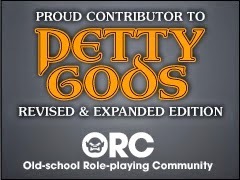 In most first and second generation OSR rules sets, Clerics work almost exactly like Magic-Users, except they do not need spell books and their spells come from a higher power, which also implies the existence of gods (or at least creatures with godlike capabilities) who are willing to grant power to their followers. In this post I talk about some alternative ways of handling Clerics and their magic. In no way it is intended to be a detailed analysis or comprehensive list of options; nevertheless, I appreciate links and others ideas posted in the comments, for this post is not about inventing something new but appreciating the richness of house rules people have shared.